This quarterly update highlights new workplace safety and health resources issued by OSHA, OSHA's Susan Harwood grantees, OSHA's Alliance Program participants, NIOSH, and others. OSHA issued the following new or updated compliance assistance resources from January 1 to March 31, 2017. For a listing of all new compliance assistance products issued by OSHA, see OSHA's New Compliance Assistance Products webpage. 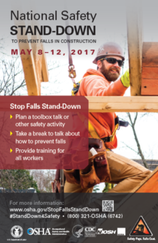 The updated webpage provides information and resources to support OSHA's 4th annual National Safety Stand-Down to Prevent Falls in Construction, including updated posters in English and Spanish. The stand-down is May 8-12, 2017. OSHA, in conjunction with co-sponsors and partner organizations, is encouraging employers and workers to host activities and events across the country to promote proactive safety and health programs for Safe and Sound Week (June 12-18, 2017). The new webpage includes a link to sign up for more information and updates; it will be updated to include resources to participate on April 17. A webpage with information about OSHA's final rule to prevent chronic beryllium disease and lung cancer in American workers by limiting their exposure to beryllium and beryllium compounds is available. The rule includes standards for general industry, construction, and shipyards. OSHA has also issued facts sheets that provide an overview of the rule (OSHA Publication 3821) and information on medical surveillance (OSHA Publication 3822) for beryllium-exposed workers. OSHA has updated its Scaffolding eTool to include new modules on aerial lifts and scissor lifts and new information on supported scaffolds (mast climbers and ladder jacks). This new Safety and Health Topics Page focuses on worker fatigue. It includes information about the impact of demanding work schedules and measures workers and employers can take to prevent worker fatigue and fatigue-related injuries and illnesses. OSHA has released three guidance documents to help employers comply with its Process Safety Management (PSM) standard. PSM is critically important to facilities that store highly hazardous chemicals. The new documents cover PSM compliance for Small Businesses, Storage Facilities and Explosives and Pyrotechnics Manufacturing. OSHA has updated its Emergency Preparedness and Response pages, which provide information on how to prepare and train for emergencies and the hazards to be aware of when an emergency occurs. The updates include new "Getting Started" information. OSHA has updated its Program Requirements for the Outreach Training Program, and also updated its procedures for Construction, General Industry, Maritime, and Disaster Site Worker classes. The changes are effective April 1, 2017. The Outreach Training Program trains workers and supervisors to recognize and prevent safety and health hazards on the job, and to understand worker rights and employer responsibilities. Through this program, workers can attend 10-hour or 30-hour classes delivered by OSHA-authorized trainers. Recent OSHA investigations found several workplace incidents involving wire rope failures, often resulting in worker fatalities. This OSHA bulletin reviews how wire rope is structured, what causes degradation, what to look for when inspecting ropes, and how often to inspect them. Updated OSHA statistics on budgets, inspections, fatalities, and most frequently cited standards are now available. 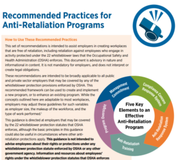 Recommended Practices for Anti-Retaliation Programs. OSHA issued recommended practices to help employers create workplaces in which workers feel comfortable voicing safety and other concerns without fear of retaliation. The recommendations, which are advisory only and create no new legal obligations, are intended to apply to all public and private sector employers covered by the 22 whistleblower protection laws that OSHA enforces. OSHA has also issued a fact sheet on Whistleblower Protection for Public Transportation Agency Workers. Responding to natural and man-made disasters puts emergency response workers at risk of injury or death from slips, trips, and falls. This QuickCard explains what employers must do to keep workers safe in these situations. The following materials developed by grantees under OSHA's Susan Harwood Training Grant Program were posted on the OSHA Web site from January 1 to March 31, 2017. See the OSHA Web site for a complete list of a materials developed by Harwood grantees. These materials do not necessarily reflect the official views of OSHA. Miami Dade College developed and provided a fall prevention training program for workers in Miami-Dade and Broward counties in Florida. Training materials include a training presentation and pre/post-test forms. The National Association of Tower Erectors developed and provided a fall prevention training program for workers in the communication tower erection industry. Training materials include a training presentation, instructor and student workbooks, and a train-the-trainer student manual. The National Roofing Contractor Association developed and provided a fall prevention training program for workers in the roofing industry. Training materials include a training presentation, fall protection checklist, fall protection plan developmental tool, student handouts, and pre/post-tests. The grantee presented three-hour fall prevention in construction training to workers in residential construction. The target audience includes small businesses, and limited English proficiency, low literacy, minority, and young workers. Training topics include fall prevention from ladders, scaffolds, and roofs. Training materials are available in English, Spanish, and Portuguese. The following products were issued by OSHA's Alliance Program participants as part of the Alliance Program from January 1 to March 31, 2017. These products do not necessarily reflect the official views of OSHA. For a complete listing of Alliance products, see the Alliance Program Participants Developed Products page. Through OSHA's Alliance with the National Association of Landscape Professionals (NALP), NALP developed a quick card describing general safety tips to help prevent injuries and fatalities while adding fuel to landscaping vehicles and equipment. Through OSHA's Alliance with the American Pipeline Contractors Association (APCA), APCA developed a best practice document for supervisory personnel and operators on basic steps to follow if an underground utility is disturbed or damaged. The NIOSH Fatality Assessment and Control Evaluation (FACE) Program conducts investigations on workplace fatalities to identify the factors that contributed to these fatal injuries. This information is used to develop comprehensive recommendations for preventing similar deaths. The NIOSH Fatality Assessment and Control Evaluation (FACE) Program issued the following reports and products from January 1 to March 31, 2017. Pipelayer Dies when Trench Wall Collapses, Washington Also available as a slideshow. Roofer Falls 19 Feet from Roof, Washington. Also available as a slideshow. Construction Laborer Falls When Ladder Breaks, Washington. Also available as a slideshow. 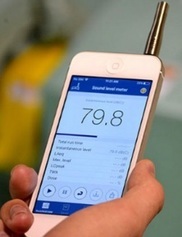 NIOSH hearing loss researchers collaborated with an app developer to create an iOS based sound level meter app that measures and characterizes occupational noise exposure similar to professional instruments. The NIOSH Sound Level Meter (NIOSH SLM) app for iOS devices is now available on iTunes freely to the occupational safety and health community and general public. 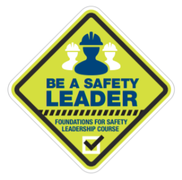 CPWR (The Center for Construction Research and Training) developed the Foundations for Safety Leadership training module, which is now an official elective in the OSHA 30-hour outreach training program course. Each year, more than 100,000 construction workers, foremen, and other supervisory personnel take the OSHA 30-hour course to learn how to identify and control occupational hazards. The new 2.5-hour FSL module fills a long-standing need to provide leadership skills training. The National Safety Council collaborated with other organizations to develop "The Real Cost of Substance Use to Employers" tool. This calculator provides business leaders with specific information about the cost of substance use (including prescription drug abuse and misuse, alcohol abuse and misuse, opioid and heroin addiction, and abuse of other illicit drugs and marijuana) in their workplace based on size of organization, industry, and state.